I purchased a Subaru 2.2L SOHC engine, wire harness and everything else needed to make it run. It is a non-turbo engine with 135hp and 143ftlbs of torque. To keep things simple I plan to install the radiator in the stock location to the engine putting it in the rear. The attached pictures are of a CAD model created in Solid Works. Any suggestion appreciated. This picture shows the rear bumper and radiator assembly. Also shown is the muffler and receiver hitch. 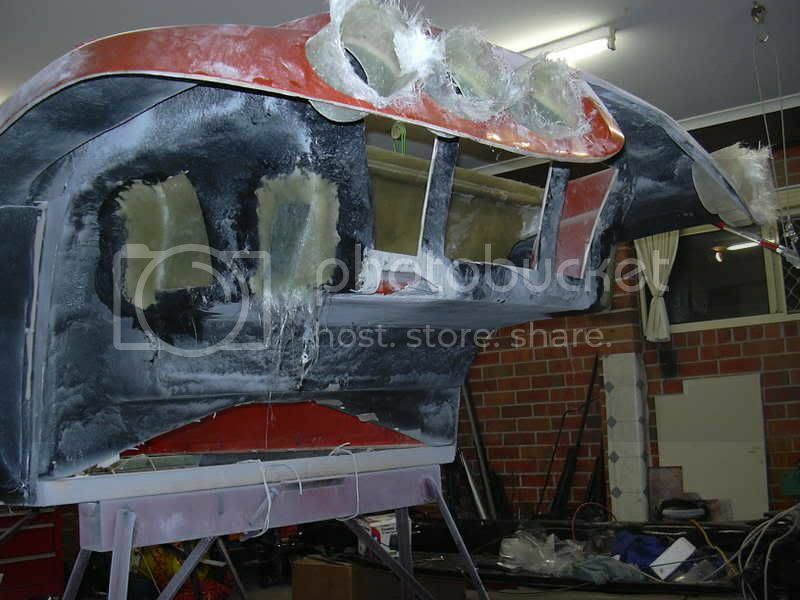 This picture shows the current bumper and VW 1600 engine. I think that's a great concept Ross, certainly your terrific graphics clearly display your ideas. If it were me, especially since you already have the buggy built - I'd try to model your set-up on the rear of the buggy first. Use your old bumper, a dummy or junk radiator rigged in place with lots of pieces of yarn tapped and tied in and around the radiator (or simple water manometer). Do some road driving with a spotter and get some idea how the air naturally wants to flow around and through that radiator. I think the biggest issue surrounding the radiator installation is getting adequate airflow through the radiator at road speeds. Idling and slow speeds, the fan should take care of no matter what the location. But going down the road at 50-70mph? That's when the natural (and likely chaotic) airflow will dominate - and needs to be utilized for adequate cooling! The rear bumper location you're proposing - which way will the natural airflow want to move? One thinks is might be from front to rear - but it might be rear to front at higher speeds! Any fans trying to overcome this natural tendenacy might instead create a stagnant airflow, making the cooling worse! Without having a Langley air tunnel at our disposal, next best thing is to do some full scale testing with simple yarn and someone to watch what it's doing. Your original plans or design might change significantly with a little testing - even some simple air deflectors around the back of the car might make significant changes in airflow direction - and make-or-break the rear radiator concept! Optimize the use of natural high and low pressure zones to do the cooling for you. Food for thought - I'll be using that technique to do similar testing for my intercooler location. Some very good points about the radiator. I feel the biggest challenge in using the Subaru engine is the radiator, of course there are other challenges like the ECU, wire harness, oil pan and exhaust but I think the deal breaker is often the radiator. The more examples and information that can be shown and tested, the more ideas will surface for a better solution. When you were talking about air flow I was reminded about the air flow inside my buggy, it flows forward, blowing on the back of my head, so I could see a similar situation in the back of the car. One thing that is a cooling advantage of the higher speeds is allot of air flow, so if it can be utilized simply and correctly, cooling shouldn't be a problem. 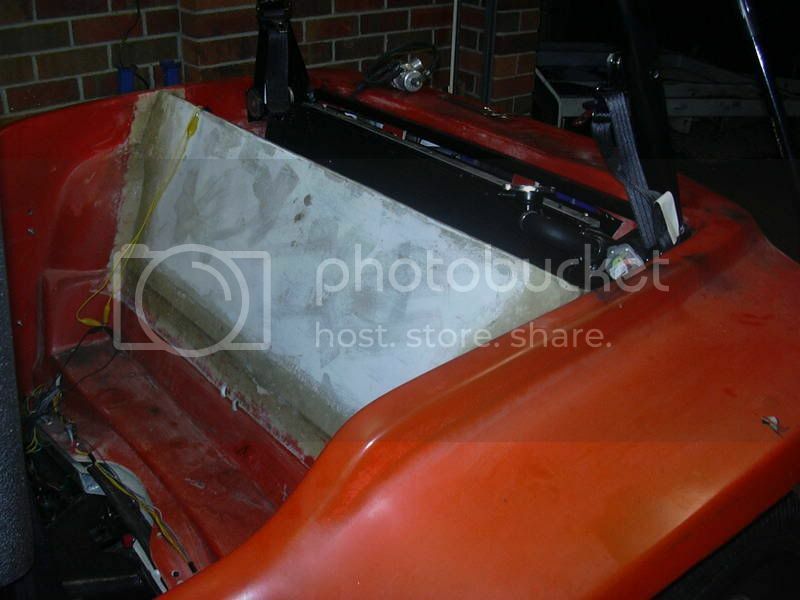 I think we should pull in as many different examples and pictures to this topic as we can find about mounting the radiator in a fiberglass dune buggy. "A great idea is a combination of related information". In a previous email you mentioned Bobs EJ25 Spatz. Also Bruce Meyers has done 2 different types for his Manxster, one mounting the radiator above the engine in a spoiler and another in the side pods. I'm trying to put together a thread to discuss and show-off radiator options on a fiberglass buggy - see Fiberglass Buggy Radiator Options. Not much discussion there just yet! I agree though - we need a data base of sorts of what radiators work and fit in a FGB. On the Manxter - I've read the articles about the car and noted the use of dual side-pod mounted radiators. I guess these would work well, but the plumbing would be more complicated. Not sure what tall/skinny radiators would work here? Probably something totally custom on the Manxter - those seem to be high-dollar builds, generally speaking! I may be wrong, but the "over the engine" mounting you're describing is likely an intercooler for the turbocharged engine, and not a "coolant" radiator. I haven't seen any assembly photos of a Subaru powered Manxter though - so can/t be certain. Oops- Need to correct that last statement! I see the Manxter dual-sport does have an over the engine mounted radiator - as it has no side pods! Not the most pleasing from the looks department - but it does keep it out of the rough! I am getting closer; I still need to locate the air box. See picture. Looks good Ross. Be interested in hearing how it cools with that layout. That does look good. Bob W. hung his radiator out the back for a while. He had a small 900cfm 12" diameter fan when it was in the back. He said it "would heat up in traffic. But that was the largest fan that would fit on the radiator." I would hope 2 fans and a shroud would provide good cooling in any condition. I really like when you can hide the radiator like above the transmission but it was more work than I wanted to take on. Was that a turbo engine with an aftermarket ECU? In airplane applications they use 2 automotive a/c condensers for the cooling and another for an oil cooler. I am sure it wouldn't be enough for a car but it is allot of cooling capacity in a small space for little money. I attached a picture. I'm running and EJ20 with a Turbonetics ball bearing turbo managed by a LinkPlus ECU. Ross, some info you should be interested in when plumbing your Subaru engine cooling system. Make sure you incoporate some bypass lines that allow water circulation from the engine block directly back into the water pump! The was the Subaru engine is designed - it normally runs a couple of bypass lines. One is the heater core circuit, others are the hot water circuits around the throttle body and air bypass valve, and on turbo engines the turbo circuit is another bypass. The water to oil cooler is also a bypass circuit. These all flow continuous water and not affected by the thermostat!!! The return inlets to the water pump for these circuits are above the thermostat, so they flow whether the thermostat is open or closed. But they must be there as they provide the hot water that causes the thermostat to open. If you just plugged all these up and ran the straight radiator connections the thermostat would never open and the engine would overheat!!! You may not need all of these circuits, but you definitely need at least one main bypass. You could also drill holes in the thermostat so it too would bypass, but not sure if they would provide enough flow? Simple enough to just route a U hose from the inlet to outlet of the heater circuit lines. While some folks will be keeping the original hoses and cooling lines intact and as they came from the factory, maintining the original bypass circuits - anyone wanting to "clean up" the engine and remove some or all of these lines must make provisions for one or more bypass circuits. Hi Mike - awesome pictures there! and "thanks" for doing that experiment for us. 14 hours home is a long way! I wonder if you could incorporate some scoops to bring the oil/air mixture toward the tire. Seems like we need a test bed to try out some of the various locations, radiator sizes and scoops to get air through a radiator. My "over trans" design has been holding up - a 45 minute ride yesterday at about 80 degrees F ambient temp, but the fan kicks in way too often. Almost every time I stopped, the fan was running. It took about a minute to kick off each time which told me the temp dropped down below 190, but with my older set up (fan mounted right to radiator) it seemed to kick in a lot less often and for less time. My current config has the fan mounted lower with a cut up inter tube connecting the fan to the radiator to act as a shroud. I have no scoop yet to bring fresh air up into the fan - that may be my next mod. One nice feature - I finally got the LinkPlus set up to increase the engine RPM before turning on the fan. Now it idles around 900 without the fan running and 1300 with the fan, so the motor won't die. 1300 still seems high - more things to modify. This edit it to apologize to Jeff GS, I wrote the stuff below without fully reading all the preceding posts. I then realized that Jeff had already said much of what I am saying and very eloquently I might add. I'll leave my post as is just in case I said anything different, sorry again Jeff. The 14 hour drive home was quite reasonable considering he'd just crossed the Simpson desert in the centre of Australia in the company of 3 other buggies. Yes that oil is a good indication of what's happening at the rear of a buggy but is it happening the same way all over the rear and would it have been the same air flow direction if the spare tire was not there? 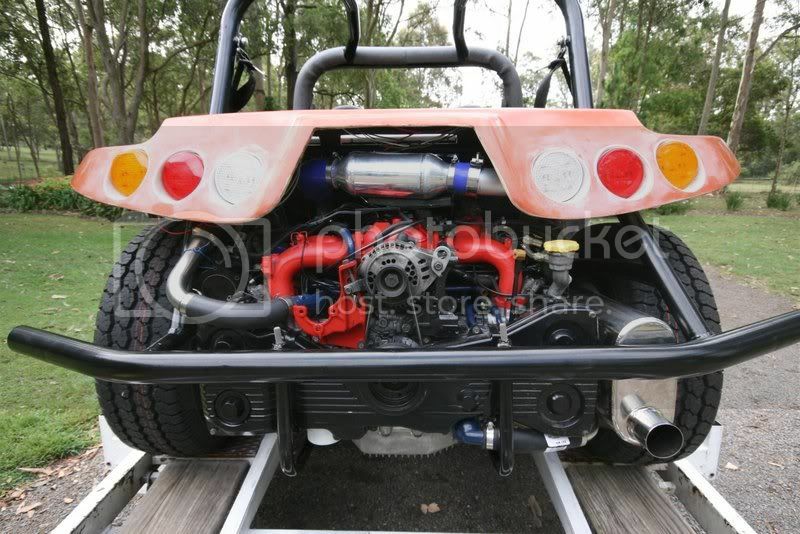 My personal opinion is that the rear air flow around a buggy is a real witches brew at any given configuration of components and bar work and any given speed. Air flow upwards at 30mph may be air flow downwards or diagonally at 60mph. Air flow upwards with the roof on may be airflow downwards with the roof off. It may be very hard to do, if not impossible, however I've often thought that doing an experiment with a radiator covered in telltales would be a good experiment. someone would need to drive behind you at various speeds to record what the telltales are doing. That of course does not solve the problem of knowing for sure that air is naturally flowing through the radiator, it may only tell you what the direction would be across the face of it. This is probably a good time and place to have a rant about something else that puzzles me regarding the mystery of flow through a radiator. We want air to travel through the radiator naturally as the car moves forward, I'll call this "natural convection" to use an HVAC term because I can't think of a better term to use. If air flow is insufficient for cooling, the T/stat brings on the fan, I'll call this "forced draft convection" to maintain the HVAC theme. One could reasonably expect that a buggy radiator may be installed in such a was that the owner thinks that that the radiator is working well but in actual fact the air is flowing the opposite way to what was intended during the natural convection phase. Then a big problem would occur when the fan came on line during the forced convection phase and it would be trying to force the air through the radiator in a direction it does not naturally want to travel. Not to mention the fact that the fan was probably freewheeling in the wrong direction at 1000rpm before the T/stat told it to start in the normal direction, that would strain the relationship with the motor quite considerably. I don't think my telltale idea would help much in determining what was happening in that situation. If we had smilys on this forum I'd be choosing the one with the confused look just about now. Is anyone using a front mounted radiator? I was wondering if it would be a problem bleeding the air out of the cooling system and if any noticeable heat transfers to the occupants of the dune buggy? While I plan on doing a front mount, I only know of one other running (fiberglass) buggy (in the US at least) using a front mount radiator. A guy on the Manxclub forums did a Suby powered Manxter, but instead of the side-pod mounted radiators he decided to do a front mount. Running a custom version of the Griffin Scirocco rad., according to the owner it has the same core size as their standard Scirocco model, but fittings are modified from the standard model to suit his Manxter. He stated he gets no hot airflow into the cockpit and it cools his 2.0 turbo motor just fine! It vents out the wheelwells. His car does have side pods - which I'd imagine do have some affect on airflow, but not exactly sure what? He's also had a very trick aluminum fuel cell made, similar to yours, that I'll be checking it out further for my build. Trapping air could be a problem, I'd incoporate an air bleed at the top of the radiator, and another somewhere in the upper engine water manifold so it can be fully bled during initial filling. Ideally both of these would be tied back into the fill resivoir with a small hose (for continuous bleeding), but I think just being able to bleed them out when filling, along with using a good overflow tank off the fill resivoir should do the trick. It wouldn't be too hard to do the continuous bleed from the water manifold though, since it's local to the fill tank. Going full circle I am considering a front mount that would cool while driving without the fans on no matter how the aerodynamics are changed with a top or hauling things on the rack. Another advantage, it would have a shorter look because it would shorten the rear by about 4inches. Exposing the radiator to damage when off road. Adding complexity to the cooling lines with more failure points. Having to cut the license plate area off the hood. For ideas I was looking at pictures of the mid-engine Porsche Cayman. It has two very low front mount radiators with the expansion tank high in the engine compartment. Two radiator instead of one doesn't interest me but the expansion tank location does. I wonder if the expansion tank just tee's into the return or feed line to the radiator? If I keep my current configuration which would require the least amount of work I may purchase an all aluminum WRX race radiator that will fit right in that has a 2-1/4" thick core verses the stock 5/8" thick core and wire the fans so they run continuous. This would add a larger safety margin. In testing when making changes to the cooling system and to see if it helped it seems to take about 20miles of continues driving to see what is going on and if it's improvement. Also outside temp makes a difference in results. The expansion/fill tank - at least on a Subaru - should tie in remotely from the main radiator hoses, that is if you want to stay close to the original plumbing arrangement. The OEM layout has the tank with a supply hose going to the inlet port at the waterpump. The other connections are inlets (to the tank) from the turbo (if you have one), the constantly circulating cockpit heater circuit, the intake manifiold and IAC heater lines and oil cooler - at least off the top of my head memory. These circuits are constantly circulating whether the thermostat is open or not, providing a means to get heat to the thermostat so it'll open when everything warms up. The main radiator circuit only connects to the thermostat inlet and water manifold on top. That's the stock arrangement at least, and IMO it should be (more or less) mimicked with whatever alternate design we come up with for cooling. I know Outback shows a much simpler system on their site - but keep in mind it is primarily for sand buggies running out West. May not work well anywhere, anytime? I'm running a small Canton expansion & fill tank, it'll be mounted somewhere in the engine compartment. The radiator will be sealed, other than the bleed and drain valves. The tank will be the highest point in the system. It will also have an overflow tank coming off the radiator cap neck of the expansion tank. Agreed about the excess lines, but could easily be done with rubber hoses (Gates green stripe) - though not shown very well that's what's running down the side of the Aussie buggy. Also, I believe the Manxter builder I mentioned before ran his lines down the side, inside his side pod and that's the same path I'l lbe using. I'm following the Renegade 914-V8 cooling system idea and will be running a 1" ID hose to the radiator, and 1.25" hose from radiator back to the water pump. You could try not fully (or any) cutting the tag area off the hood?? Then main thing - as least in my thinking, is to ensure a sealed area leading up to the radiator face, so that air can't bypass it. Even some short sheet metal side and top pieces in effect "funneling" air to the radiator face would do the trick - and especially not letting air bypass over the top. The 13" high Scirocco size radiator fits really nice in the nose of my Deserter with just a moderate amount of trimming of hidden areas. The main issue (for me) is how the inlet/outlet fittings are positioned and fit around the front chassis and suspension. The Manxter required a slightly higher lower return hose mount than standard Scirocco - and I think that's what I'll need too. I'm pretty sure at this point I'll wind up using a custom Griffin radiator with some version of the Scirocco dual pass core. I am new to the concept and am planning my own "project " here soon but I have been thinking of conduit or even copper lines for the cooling from a front mount Rad. The reason being is either metal will dissipate even more heat than a rubber tubing and may require less clamping than rubber. Conduit can be connected with rubber couplings called Fernco's and could be Brazed, copper on the other hand could be soldered or even sillflossed as well as rubber clamps. Just a idea I have been messing with. 1) It looks like he's running a lift kit between body and frame, which provides extra room for a taller rad. 2) While there appears to be adequate room behind the radiator, it seem like the installed angle would work against (at least to some extent) getting the hot air out the back of the radiator and out the fenderwells. The radiator is angled forward, so the exhaust has to take an almost 90 degree turn to exit downward, though somewhat less angle out the sides? I'd definitley insulate the fuel tank from the downstream heat. Still, looks good - I'd like to hear how it worked out! 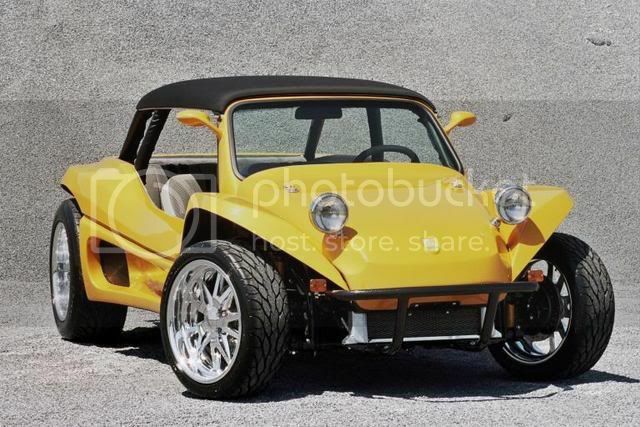 Oh yea - I also really like the front hood arrangement on that particular buggy! I plan to do a similar "hinged hood" arrangement modification to my Deserter. Having the tank filler in the fixed portion of the hood is a neat detail - one thing I hadn't quite figured out how to do. Nice! Been meaning to respond to his post - that Sandshark is a great looking buggy DL! It really stands out as a much more "finished" looking car, the dash and interior alone put it in "another league"! Looking great! I think it really sets the standard for a new generation buggy. Sure wish we could get a version of your fuel cell over here. Also to Tom - what kinds of issues have you been having with the silicone hoses? If I recall correctly - you ware using the nice T-bolt style band clamps for attachment, would seem like your guarantee for no leaks would be intact with those! I did note a "lot" of joints with the dual radiators though. I saw some spring loaded t-bolt style clamps in McMaster Carr that would seem to ensure constant tension on the hose fittings? Maybe they could be substituted? Is the hose getting squished out under the clamps? Using re-inforced hoses? Seems to be a lot of silicone hoses out there now, I can imagine some might "lower quality" and maybe not the ones to purchase. I guess anything under the Samco brand would be good? I'll need to use some silicone hoses in my system in a few different locations, but from your post I'm a little spooked about them! I know you don't skimp on quality! Jeff, I was going to suggest the T-bolt clamps, but I had a look at his album and they are all T-bolts now. One thing like you say, there are tons of joints! I think I would try to have some tubing mandrel bent so you minimize the joints. Tom, With the hoses on there now, you've got a full size mock-up, you would think that a shop could bend you up something nice based on what you have currently. I'm sure my suggestion is not what you want to hear, having only made a statement about the clamps needing constant attention, but in the event you are looking for something of an answer to your issue, this may just come in handy. Jeff, I don't know if the spring t-bold clamps would be a good idea or not. I guess it all depends on the spring offering the tension. I know in order for me to keep the silicon hose on on my intake, I have to tighten it so hard that it creates hose "squeeze out" and I'm only running 10 LB of boost. I imagine 12-15 psi of a slippery liquid like coolant would present its own issues. I'm wondering how beneficial the spring clamps would be when you have to get the clamp so tight, you're worried about galling the threads. Dunelimo, Real nice ride. I agree the interior fitment is spot on! Good on ya. We are using Samco brand hoses, so the quality of that is not suspect. The hoses don't seem to be changing, it just seems like the clamps are losening up, without the clamp nut changing because they are nylock nuts. What makes it worse is that some of the connections are in the sidepods and are only accessable by removing the sidepods. Fewer connections would be nice (and maybe help more with the cooling) but would be a lot of work at this point. Also, using only @ .030 thick alumininum tubing, I would be afraid of cracking. Some flex joints would be nice. Each radiator has a bleeder valve and the lower crossover pipe that goes from the bottom of the engine and over the transaxle to the bottom of the radiators also has a bleeder valve. I think we are getting all the air out of the system. Like I stated, the engine runs cool. A desert test may be in the future. I saw your posts over on the Samba relating to airflow in/out of the side pods. This got me thinking (while waiting on the turkey..... ) and wondering exactly how does the air exhaust from your side mounted radiators? While I'm going to install front mounted radiator on my Deserter, I am planning on tucking an oil cooler in the passenger sidepod. Currently have plans to create air intake "scoop" openings in the sidepods similar to the Manxter, and on the right side I was going to use a portion of the airflow to cool the oil cooler (the rest, from both sides I want to duct to the intercooler above the transaxle). I was thinking of just fitting a louvered panel at the rear of the side pod, directly in front of the rear tire, but that Samba post now has me doubting this as a good idea? Since you run all the cooling from your sidepods, exactly where does that air exhaust from the pods? FWIW, before final paint and bodywork I'm going to assemble the car to a drivable state and do some manometer and probably some yarn testing on airflow. The intercooler airflow is going to be particularly tricky. The Deserter GS has a natural high pressure area inside the engine compartment. I think some of this air comes up from under the car, but entirely possible it also tucks in from behind too! I believe I could use this pressure zone to pump air through the intercooler - directly up through the engine cover, except it is all pre-heated air by the engine! It needs to be cool, hence the side pod scoops for a clean air source. The way the side pods flare out at the rear on the GT body, I've got a good hunch they create a high pressure area right where I want to put the new scoops. I wouldn't mind fitting a rear spoiler of some sort, but this would seem to work against wanting a low pressure area above the engine cover for exhausting the intercooler airflow. I see what you mean about the side pods (on that orange Manxter) and how they extend up and over the rear tire! Never noticed that before and just assumed the pods opened up right behind the radiator and vented out in front of the tire. Not so! I'll really have to re-think my oil cooler location and ducting ideas. I can easily stick it in the side pod and get air to it, but getting the air away will require some more think'in. Don't have room to duct up over the tire (like the Manxter) as my suspension travel uses up most of the available room. Might be able to vent out the top of the engine cover? I guess only airflow testing will provide the information I need. Come to think of it, fellow GS owner Mike Rags has his oil cooler ducted such that it takes air in from the engine cover "scoop", just behind the cockpit. It exhausts into the wheelwell, next to the rear tire. The cooler is augmented by a fan, which Rags typically runs all the time he's driving. I recall riding passenger in his car Summer before last and noted what felt like warm air coming out of that scoop while going down the road. Rags looked down and noticed the fan was not turned on, a big concern with his built 2.3L turbocharged VW engine! However, is oil temps had remained in the near normal range - largely it seems because the natural airflow was pushing air through the cooler "backwards" and into the cockpit. This experience seems to support that the rear wheelwell is a high pressure zone, at least the forward and mid-portion behind the tire! First off let me admit that I haven't read this whole thread. I have been contemplating a Suby engine in the future. My idea for radiator mounting is to use a long length equal to rear seat width, short height radiator. Mount the bottom about even with the rear seat bottom area and angle it up 45 degrees or so to behind the tag area and across. There would be enough room for a couple small fans on top or if you feel ambitious close off the ends with fans and force feed it. Maybe even be able to put a couple scoops under there. Need a way to keep rocks out though. Don't know if I explained this well, sorry. Dune - have you guys figured out how much radiator area is really required to keep a Suby cool? Like minimum length x width x thickness of the core? I have yet to find anything like that on the 'net, except for old brass radiators, which I don't think really applies to modern aluminum dual core radiators. I've been searching for a suitable aluminum radiator for my GS. I find plenty available in the Scirocco/VW style that "might" be too small, and a few others I'm sure would work but would be a tough fit because they're a bit too large. These are off the shelf models, which are always less $$$ than a custom built, and always trying to save that money whenever I can for other parts. Knowing how much area is really required would help narrow the search. One thing I found out is that location/ducting has a tremendous amount to do with efficiency. I guess that is self-explanatory, but in a buggy, where the ideal location isn't possible, it's really a guessing game. Tom and Kathleen have a very nice dual radiator set up, but the plumbing is obviously more complex. Tom did an excellent job fitting his radiators too. I originally had a stock Legacy radiator hung out behind the engine. It looked HORRIBLE in my opinion, but it functioned well. I moved the location to the back seat area, and the rad instantly became too small. I bought a dual core radiator, which was slightly bigger than 1/2 of the stock surface area was, so I figured it would provide more cooling. That also overheated. I also tried a pusher AND puller fan on that unit and it still overheated. It was just in the wrong location with NO free airflow. I finally settled on a Ron Davis unit which would provide me with plenty of overkill (still mounted in the rear seat area). So far, with the dual puller fans, she has held up well to northern summer heat. I'll get the chance to really test it out this spring when I take the buggy to Texas. I currently run a 2.5 SOHC with the radiator out back and have no issues with overheating. The car is equipped with two fans, normally only one fan will cycle on and off. The second fan has only kick on when the car has been used in the sand dunes. I chose the rear of the car for a couple of reasons, one being n easier install and two to keep the radiator out of harms way while off-roading. The radiator is a C&R 31"x14" with two heavy duty off-road fans. Appreciate it, my buddy and I built it and have had a lot of fun with it. We currently are in the middle of another project, VW thing with a 2.5 SOHC Subaru. 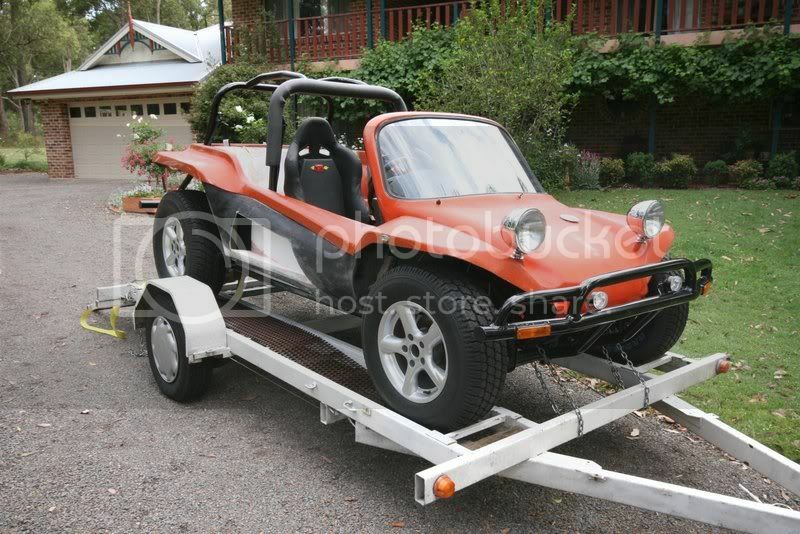 I have attached an additional picture of my buggy and plan to post some pictures of the thing in the future. That's a good looking buggy Wade. I like how the rear radiator is down low and not obstructing the rear view. That radiator is pretty close to what I'm looking for, except I'm limited to about 26" wide. I may shoot an email to C&R and see what they want to build a shorter one. I mounted mine under the old rear seat area. Lots of work but looks and works great. Here is a pic of what I removed and what it looks like now. Here is where I located a Jeep Cherokee radiator, it is mounted to rear firewall with a 1 1/2" air gap. No holes were made, I added two 10" puller fans. This set up seems to get a lot of air for cooling, to get air flow intake I believe in always make incoming air more constricted than outgoing air. Works for me. This project is in mock up and testing mode. My junkyard motor broke the junkyard transaxle, looking into a Rancho unit. How did the jeep Cherokee radiator work out ? Sorry I have not been online with the forum for a long time. I am still using the Jeep Cherokee radiator in same location. I have added a side air scoop on passenger side (about the size of a shoe), seems to work fine. With out it I had some problems. I am running microsquirt and e85. I have a Rancho unit with super different and freeway flyer gear ratio. I am adding higher compression pistons, 12 to 1. I have a lot more work to do but I love it.